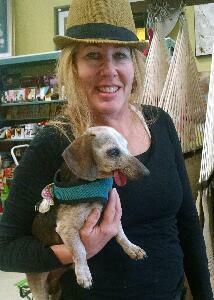 one of the great pleasures of working in a dog~friendly store is getting to meet people.. who love dogs. But FOUR dachshunds. -and not 4 cute dachshund puppies.. But 4 seniors, each with their own unique traumatic histories which landed them in shelters. -allow me to introduce, by wing color..
Dabby. Silver wings. 15 years old. and Casey. Flames. 10 years old. Rico. Whose tongue is permanently dangling out to the side.. and whose charm is only increased by a very slow limp, limp, waddle, spontaneous scurry to try and catch up, then limp, hop, limp waddle..
apparently the owner/baker at prim rose bakery, down the street and around the corner from us.. was inspired by Rico's story and iconic appearance to create "the Rico"